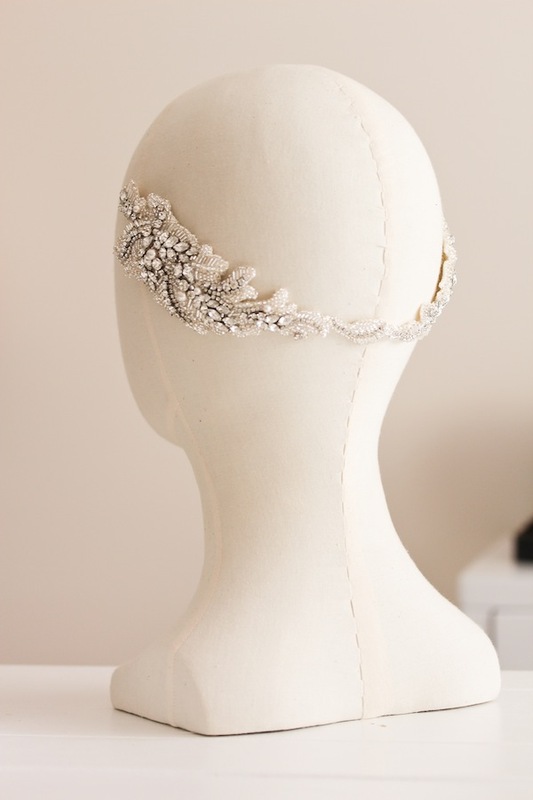 There have been many times where I have created a bespoke headpiece that I fell in love with, and I found it so hard to pack it in a box and ship it away. Often when this happens, I want to catch a plane and personally deliver it. This is exactly how I felt when I started chatting to bride-to-be Gemma about her bespoke bridal headpiece. 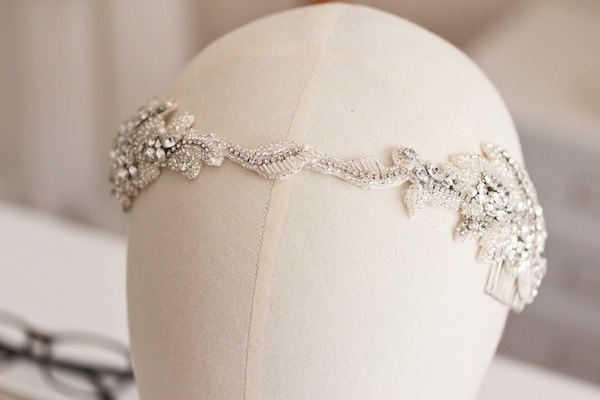 The right headpiece not only reflects your personality, it captures the mood of your big day. And Gemma’s vision for her big day is the stuff that dreams are made of. Over several emails, I discovered that Gemma was one ultra stylish and sophisticated bride. She sent me lots of photos of her wedding dress and jewellery options which were stunning to say the least. It wasn’t too long before Gemma and I came up and with a beautiful design that took into account all of her favourite intricate details – rhinestones, pearls and a headpiece which was both sophisticated, enchanting and glamorous without stealing the attention away from the silhouette and beautiful lace details on her dress. Over many, many weeks in the studio, Gemma’s special headpiece came to life. Aristotle said the “whole is greater than the sum of its parts”, and this headpiece reinforces this timeless quote. With my two hands, Gemma’s exquisite vision and thousands of tiny seed beads, rhinestone crystals and pearls, together we created something truly unique and special. It was a labour of love which I crafted 1cm at a time to ensure that each little bead was securely attached and reflected Gemma’s preferences. I started on the right side and then quickly moved across onto the left side to make sure that the piece was symmetrical and featured consistent details. I can’t help it… I’m a little details obsessed! What I love the most about this rhinestone bridal headpiece is that it can be worn along the forehead, from behind to adorn a half up/half down hairstyle and even to finish a low set bridal updo. While heavily beaded, it is flexible enough to mould against the shape of a range of different hairstyles so Gemma can wear it again and again to anniversaries and dinners under the stars. What more can I say? I loved working with Gemma and I’m so proud of this headpiece we designed together. I can’t wait to see photos of Gemma in this headpiece. She will surely take bombshell to new levels.